In this section, we feature letters written to us with the author's permission. These letters are heartfelt, as are all the letters that we receive. We chose these though to demonstrate that, with help, these affected dogs can live good lives and even long ones. We hope you find their stories helpful and encouraging. We know we did at Toby's Foundation. Toby prepares to answer your mail. Toby's family and friends will continue to answer your email and letters. In Loving Memory of Jimi who can be seen in our Aussie Album's Memorial pages. Jimi was a great trail dog, brave and lovingly loyal who died too young because of this terrible disease. Jimi was the most beautiful mahogany red bi Aussie imaginable. As a puppy he was stunningly cute, funny and rambunctious. He was our third generation (span of about 30 years) of Aussies. He, together with his blue merle "sister" (two months older than him), were to become our next great trail and horse dogs as well as Papillon protectors on our small high desert ranch. We carefully selected reputable breeders, waited the interminable period for the pups to be born and grow big enough to come home. We were delighted to have two beautiful loving pups to love and carry on the work of our beloved previous Aussies whom we missed terribly. The pups loved their daily hikes and eventually grew strong enough to go horseback riding with us. Jimi loved to run with the horses and carefully scouted the bushes for stray coyotes or jack rabbits chasing off anything that would scare the horses. He was vigilant and tireless on the trail, the best trail dog one could want. He was also good at guarding the ranch, announcing visitors and keeping the deer and coyotes at bay. He was gentle and kind to the little Papillons in his pack but like all brothers he loved to torture and tease his Aussie sister, Magic. He was also a wonderful house dog. He loved lounging on the couch or lying in front of the woodstove on a cold day. When he was about 15 months old I came home one day and he was acting strangely. He was nervous and submissive, definitely cowed by something. I thought maybe he had gotten shocked on the electric fence around the pasture. This was the beginning of his neurological symptoms. I soon started a journal to record his odd behavior consisting of weird grimaces, some whining, drooling, anxiety and pacing. A few times I found him standing "frozen" in place. These symptoms occurred randomly without pattern. Sometimes they would happen daily, sometimes a week apart. Hard exercise seemed to alleviate his symptoms. We tried a Thundershirt and Rescue Remedy but they didn't seem to help. His vet really couldn't help us at this point. His breeder was starting to suspect that he might have epilepsy although she had not had any epileptic dogs in her lines. Finally 9 months after first noting his odd behaviors he had grand mal seizure that lasted for twenty minutes. His vet started him on a low dose phenobarbital but the seizures returned. Soon he was on the maximum level of phenobarbital and still seizing. Three months after his first seizure he was started on potassium bromide in addition to the phenobarbital. The side effects were terrible. Our wild rambunctious trail dog was now staggering, rummy, incredibly thirsty and felt like he was starving. The seizures continued and were terrible. He would try to hide from the pain and stress. He was so distressed that he even howled in his sleep. We did everything possible to comfort him but the symptoms were getting worse as were the medicines' side effects. Finally when he had 6 grand mal seizures in a row and I found him unconscious on the counter with his head in the sink I knew it was time to relieve him of his suffering. Poor Jimi was just 2 and 1/2 years old when we had to say goodbye. This horrid disease took this beautiful young boy in the prime of his life. When we were able to bring home the sweetest most beautiful puppy in the litter we felt truly blessed. Taking care of Jimi was really difficult because we felt so helpless, but his bravery and loving loyalty throughout his ordeal was so inspiring. We really were truly blessed and are thankful to have had him with us despite his short stay and his terrible illness. 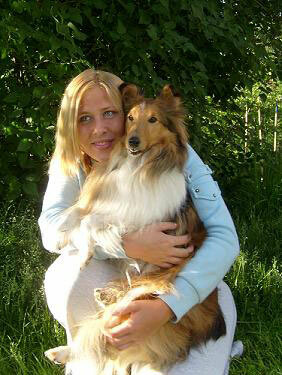 Please see Tinka's story from Carina in Norway as of April 2011 here. Tinka passed away in August 2013. Please see the update below. Me and a friend (who also had an epi-dog) was talking about how hard it is to give advice to people that had their dog newly diagnosed. You don't want to give them false hope, you want to be realistic, but you also don't want to take away their hope or will to fight for their pup. So came the idea "if you could write a letter to yourself, and send it back in time to the day your dog was diagnosed, what would you write? If you didn't have to consider the dilemma of not giving false hope vs not giving enough hope, what if you could base this on your own experience only?" This is my letter to myself, to the "me" that just came hope from the vets 7th of august 2003. Apologize in advance for the translation, it was originally written in Norwegian. Right about now you're just sitting there, holding your dog real close. You have cried the whole two hour journey home from the Vets Academy, and you have thousands of thoughts rushing through your mind. You are sad, confused, unsure and terrified! Terrified of losing the best thing you have in your life. You are worried for her quality of life, and you are scared time is about to run out. You haven't had her long, but you knew from the first moment you met, that Tinka and you belonged together. Now you're holding her tight, clinging to her for dear life, scared she will be gone, just as suddenly as she came. You're thinking you're not strong enough to take care of an ill dog, that you're not good enough, wise enough, or responsible enough. No, maybe not yet, but with every day, every seizure and every challenge, you will rise to the occasion. When it comes to Tinka, you will find a strength, and an intuition, you didn't know you had. You will put Tinka, and her needs, before yourself, and it will feel completely natural. You should not let grim statistics frighten you, you should not compare Tinka to dogs you read about online. Every story is different, and no story end exactly the same. With that being said, you might as well prepare that these seizure monsters will follow you for the rest of Tinka's life. They will always be there, they will sneak around in the background, and attack at will. Your Tinka, she is strong. Never doubt that. With you by her side, she will fight the monsters, and together - you will be the strongest. Right now, I know it seems impossible, but you will learn to live with this. And you will LIVE! This illness will not stop you, as long as you don't let the worries and fright take over your life. Get in touch with other people that live with epi-dogs. It will mean everything. You will turn your life up side down for this dog. You will find great comfort in knowing there is people all over the world doing the same. You will have to make many hard decisions when it comes to treatment and medication. Follow your guts! When it comes to Tinka, your gut feeling will be spot-on. Keep a good dialog with your regular vet. Together you will find good solutions, day by day, year by year. Give your mum a really good hug! She will pay most of the vet bills, and be a big support in the years to come. Many years from now, someone will write you these words, and they will speak straight to your heart. I will show them to you now, because they describe so well how life with Tinka will be. Keep them in your heart, and say them out loud to yourself whenever you feel the need to. 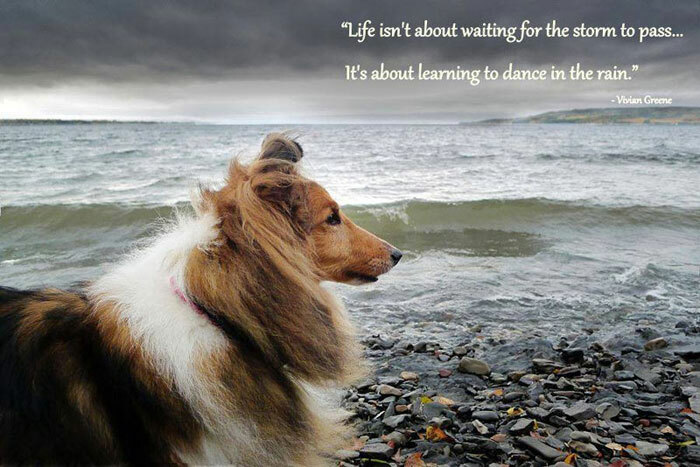 "Life isn't about waiting for the storm to pass...It's about learning to dance in the rain"
Some times you will just see the dark clouds far away, and dance in soft summer rain. Other times you will find yourselves dancing in the eye of the storm, clinging to each other, terrified of letting go. You will experience so much together! So much happiness and love. This is the start of an amazing adventure. Take the time to stop and enjoy. Cherish everything, your little adventures, as well as the once in a lifetime experiences. Feel the butterflies in your tummy, and remember that feeling. The small moments will be the best memories. As you are already painfully aware of, all adventures come to an end. I wont tell you when it ends. One shouldn't know these things. I will however tell you that its still very far away, and you will celebrate more birthdays that you dare hope for. Never underestimate Tinka's strength and will to live. When the end draws near, you will know. You will have time to prepare. No monster will tear her away from you. You will now when it's time, and in your own way, you will accept it. You will survive (yeah, really! ), and you will feel so lucky, that you were the one that got to experience this adventure. You have just started a journey, that I would give anything to do again. On Sunday afternoon we had a long conversation with our best friend Buddy. After years of dealing with Epilepsy and other health issues, we were fortunate enough to be able to say good-bye to him. When he approached his first birthday, we experienced his first seizure. A month later we experienced another and our journey began. There was no set pattern, but generally we would go 12 to 14 days and then you never knew if it was going to be one or cluster seizures. A few times we even had 2 to 3 days of seizures every hour. The seizure was difficult but honestly in hindsight dealing with the post ictal period was the hardest part. We experienced it all! We became experts at giving rectal diazepam and then dealing with the post ictal period. We had the best care from Dr. Karen Kline, Neurologist at the VCA Specialty Hospital in Lynnwood, WA. For 6 years we tried different drugs and combinations, along with years of acupuncture. We had every test imaginable done to conclude he was epileptic. We set up a video camera system at our house so we could watch him during the day while at work. Simple and it worked great. Highly recommended as it gave us peace of mind and we did catch him several times in the midst of a seizure, so we were able to rush home. Regardless of dealing with this we had the greatest friend, companion and family member imaginable. The disease and medications took a toll over the years. He had other issues. Around year 2, he stopped eating and was throwing up his pills. He had internal health issues and was on 5 mg of Prednisone (steroid) for many years. When this health issue started we noticed the cheese we were using to hide the pill was not dissolved so in essence he was not getting his pills digested. We went to vanilla ice cream which was a life saver. Make a pill pocket and put the pills in. He loved it and we knew the ice cream would melt and the pills would get digested quicker. It was great for the post ictal period too as we would give him oral diazepam and he would slurp it down in the post ictal state. Around year 3 he started chewing on his feet and it got so bad that we had to boot him as seen in the picture. He also over the years gained weight, a good 20lbs....we would laugh and kid about his big fat belly. Around his 5th year he broke a canine tooth and his root canal required bringing in a special anesthesiologist due to the complexity of his drugs. 8 months ago he started having troubles walking and it was due to his upper femur bone popping out of his hip joint. He had surgery and it was months of rehab and either carrying him or lifting him with a sling. To no avail, his good leg and hip went bad so now we were dealing with rehab the surgical leg and save the non-surgical leg and hip. We carried him, lifted him, walked with him for many months and would have continued to do so had his body not given out further. My wife and I dedicated ourselves to Buddy and in turn he dedicated himself to us. 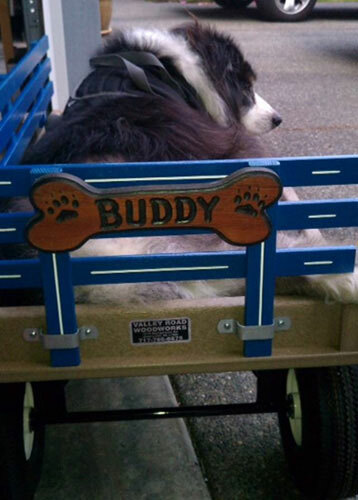 We found doing things with him like walking on the beach were fun so we built a home on the Washington coast to take him on weekends, and the house is named in his honor, "OUR BUDDY HOUSE". 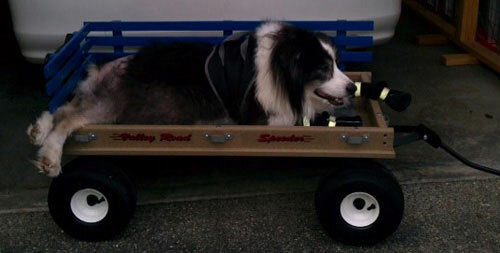 It got to where a few blocks of walking tired him out, so he was happy to be rolled around in his Buddy Wagon! We enjoyed just laying on the floor and doing simple things like rolling the ball. You can have fun doing simple things with your pet! We felt so blessed to have Buddy. He was the friendliest, most loving dog in the world. There was not a person or dog of any breed that he was not friends with. He taught us about love and changed our lives forever. My wife and I know that when he came into our 13 year old daughters life, he molded her into the great young lady she is today. She had to come home from school and watch him until we came home from work. She learned how to deal with epilepsy and I must say that I think she dealt with it better than adults. Children are very resilient and capable. We are most thankful that Buddy taught her to love, take care of someone other than herself, and be a responsible person. I truly believe that Buddy was responsible for her growth and development in a way that no human could have ever done. We would like to thank Toby's foundation. Over the years we have tried to donate when possible and hope others who possibly read this might do so or continue to do so. Let's find a cure for epilepsy and continue the important research needed to cure this disease. Again, thanks to Toby's foundation for everything you have done for Buddy and other epileptic dogs. If this gets published I hope that whoever reads this understands they are blessed with having a "Buddy". Buddy is now at peace running and playing in doggie heaven. It is with a very heavy heart that I update this page with the notification that Hansel is no longer with us. His condition worsened dramatically in the last few days and we made the very painful decision to let him go to rest. 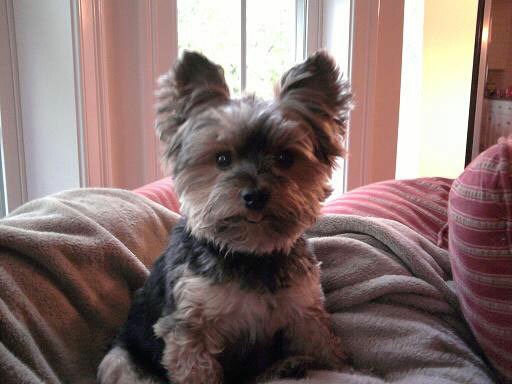 We miss him terribly, he was a great little dog, but feel that because of what transpired there was no other option. This picture is how I want to remember Hansel. I wait for him to come back to my wife and I in another form, in our dreams, and as we walk on the street. We know he is with us and loves us and our daughter. I will send emails to all who responded, and the original email distribution lists when I can. I thank you all for viewing and for those who responded. 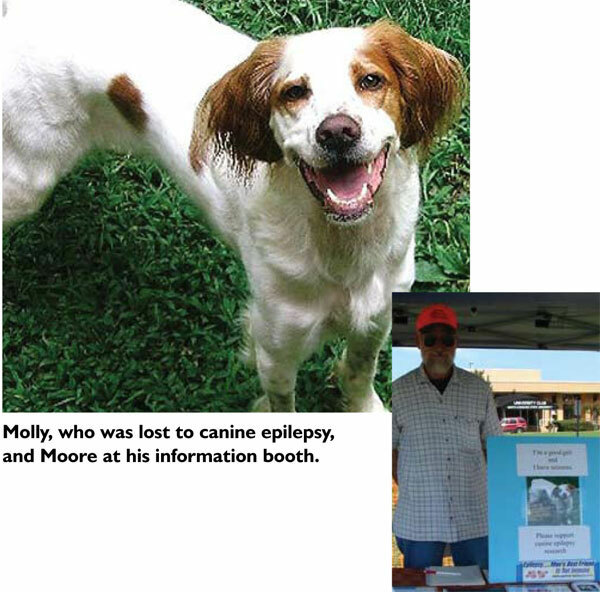 This story comes from Willard Moore in memory of Molly. Molly's story "A Mission for Molly" is reprinted here with permission from the CVM magazine. I was at the ASCA Nationals last September and made a small donation to your organization. I wish I could have done more. I had mentioned that I had two Australian Shepherds who were diagnosed with epilepsy. Major (Herne's Major Investment, CGC) is 8 years and had his first seizure at the age of 14 months. He has not had any known seizures for 4 years (but since I work, who knows for sure). But he has issues as a result of multiple seizures in a short time and will always be a puppy mentally. He is on phenobarbital and potassium bromide. By the way, he passed his CGC at the age of 5 years, almost 4 years after diagnosed epileptic. Jake (Herne's Jake the Bagpiper) had his first seizure April, 2013. Then none until November. Then it seemed like approximately every two weeks he might have one. They seemed to be worse each time. He was on phenobarbital. This past Sunday, February 9, 2014, he had two seizures in the early morning 2:46 am and another at 3:24 am. I went to a match around 7:30 am and he seemed pretty much stable as in the past. When I got home around 3:30 pm, I could tell from his condition and the condition of the 4 x 4 pen, that he had at least one more seizure. That evening at 6 pm he had a seizure. The next morning he seized at 12:03 am and again at 4:23 am. I took him in to the vet at 8 am. His eyes told me that he had had enough. We were put in the "comfort" at 8:30 am. It was not even 5 minutes and he seized there. It was bad but not as bad as what I had seen before. After talking to the vet, I made the decision to send Jake to the Rainbow Bridge. I stopped at my church on the way home and spoke to one of the assistant pastors. He made the remark that Jake is now with the Good Shepherd helping to herd His flock. It was a tough decision, but I feel better knowing that Jake will not have to go through that any more. I miss my boy. One of the best gifts would be to find out where and what is causing this horrible thing to happen to our best friends and eliminate it. Please keep up your efforts and getting information out there. Too many tend to ignore what is happening to our dogs. I wish I could do more, but unfortunately all I can do is to talk about what has happened in my personal "pack" and encourage others to do what they can to support your organization. This letter is from Marta about her dog, Bones. Bones can be seen in our Aussie Album. Thank you for your kind words, they are reassuring. Bones is a 14 months old red tricolor Aussie. She had her first ever seizure this Saturday at 3:45 pm (and another one at 11:35 pm). I can't seem to scrub off the fear and anxiety of her having another one. She's the only thing I can think of. We were on a trip out of town so we called the vet immediately who prescribed Diazepam in case of another fit, while waiting for today to have her brought in for tests. My life will certainly change, and I will do what it takes for her to live a happy and long life with me. Bones is my first dog (we had many dogs in the family), but she's the first I care about on my own, and for a first dog experience I didn't really expect this, alas the chance she has epilepsy is here. We have to deal with it. What I want to know is if the meds work how many seizures on average could I expect a month? What really destroys me is not knowing where, when and how. At present I try to stay calm, to avoid agitating her, but I live in constant fear. Many do not seem to understand me, and foundations like yours help me feel listened to by people who share same experiences and know what it means. Marta Scetta from Milan, Italy. I came across your website yesterday and felt I needed to share with you our story. The description of Toby's journey is all too familiar and hits very close to home. Shortly after what we estimated to be Bear's first birthday, he had his first seizure. At first it was quick and seemingly harmless. The vet recommended waiting to see what happened next before diagnosing him with epilepsy, as sometimes young dogs can have one seizure, never to have another one again. The next three months were quiet and we thought we would be okay, but one day he started having a cluster of seizures and we had to take him to the emergency clinic. Ever since then, he has been having seizures anywhere from one day to several months apart. He has been on a variety of drug cocktails, all in an attempt to control his cluster seizures. We have tried different combinations of phenobarbital, potassium bromide, zonicimide (a newer drug on the market), anti-anxiety meds, valium, and chlorazipate (the last two to stop the clusters). Nothing seemed to work. Bear had a very serious episode in May of this year in which he had 13 seizures in a 48-hour period. The only way to get them to stop was to have the doctors completely sedate him. After that, we too took him to see a veterinary neurologist who ran all of the tests, only to find nothing wrong. After that episode, however, his seizures completely stopped for almost six months. We thought we had finally found the perfect combination of medications, exercise, and good old-fashioned love. Sadly, though, we did not get our happy ending. Just over a month ago, his seizures started again and no amount of adjustments to his medications was getting them under control. As we continued to go back to his vet and increase his medications, the side effects got worse and worse. Bear became incredibly disoriented and disconnected from us. Periodically, he would even lose his eye sight and start running into objects around the house and getting lost. He was lethargic and not in the least bit the dog we had come to know and love. Aside from all of that, his seizures persisted, sometimes a few in one day. We were becoming aware of the reality that Bear was going to continue to have seizures no matter what we did for him. The medications and side effects may have been worth it if they at least controlled his epilepsy, but at this point the meds were doing nothing but adding complications. We took him into the vet early last Tuesday morning (two days before Thanksgiving) to discuss the next step, and our doctor made it very clear to us that there was nothing else we could do for him. If we let this go on any further, the doctor's prognosis was that he would continue to deteriorate and would eventually fall into "status epilepticus" which we would not be able to bring him out of, and that would be a terrible way for him to go. We were forced to make the agonizing decision to euthanize him. We simply could not watch him suffer any more. Needless to say, our lives will never be the same. It is amazing how profound of an impact this animal has had on our lives. In Toby's memorial, you wrote "Toby was more than just a dog to us...he was our boy." That is exactly how we felt about Bear. We have a second dog, Benji, who is lucky healthy and happy, and we love him immensely, but he is not Bear. We may never share the bond we had with Bear with another living being. We needed him just as much as he needed us. He changed our lives for the better and he will ALWAYS be in our hearts. 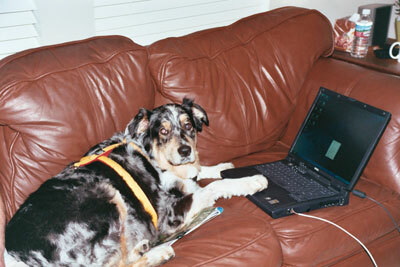 Surprisingly, I never came across your website over the two years that I spent extensively researching canine epilepsy. I only stumbled upon it now because we were considering starting a foundation in Bear's name to support the research and cure for this horrible disease. I wanted to see what similar foundations were already out there, and luckily I found Toby and his story. We have decided to donate to your foundation whenever possible (no need to reinvent the wheel). Your love and dedication to Toby has truly inspired me. When we first lost Bear, it was easy for me to feel mad. I was selfishly thinking "Why us? This isn't fair, we don't deserve this. Bear did not deserve this." After reading your story, I realize now that we are not, and never have been alone in this. This did not happen to us. It is not as if we were pre-selected for this experience. This randomly happens to many unfortunate dogs and their families who love them. All we can do now is learn from it and help fight this disease so that it will not affect the dogs of future generations. I thank you for your dedication to this cause and for sharing Toby's story with us. This letter is In Memory of Jack Angelo who can be seen in our Aussie Album's memorial pages. I remember the first day I ever laid eyes on you. You and your siblings were in a brown box and it was early December. You were about 4 weeks old. I went to visit you all and to look at the only other boy available, a shy black tri. You were already spoken for by someone else. We were talking and you were so distracting. Everyone else was asleep and you were trying so hard to get out of the box you were in. Climbing, clawing, growling, and you know what? You finally did it. You escaped. Within 10 seconds, you were put back and I could tell how frustrated you were. Just like your mami, you cannot be contained. I think that's been my lesson about you. After I took your brother home, I hoped you'd be ok and everything would work out for you. About a month later, I found out that you needed a home. Well, how could I resist this blue puff of fur? I picked you up and you were tiny, covered in dirt and snow from frolicking around after a Lubbock blizzard. You did not want to be in the seat next to me and were clawing your way out. You were a mess. And so was my car. I ran a warm bath and bathed you so carefully. When I finished, I wrapped you in warm towels and in a crate. You fell asleep for hours. I kept checking on you and you were so comfortable and warm. That made me so happy. I had to always take care of you extra special. You were underweight and had to be fed 6 times a day! I'd come home several times a day to feed you...It was so worth it, as you began to flourish and be such a happy boy. You and your brother were such a handful, but were so crazy beautiful and sweet. I couldn't resist you both. Our lives changed in April of 2010 and nothing would be the same. You were there through it all. From the time we moved to Washington, you made yourself the center of attention. You were such a handful. You were upset, bossy, anxious, and needing attention. We buckled to your every need and tried not to anger the neighbors in the process. The first day we were in our new home, you barked like CRAZY. Ugh. Once we took you off the tether, you were fine. Again, you cannot be contained. You made your own rules and didn't conform to anything I was used to. Crate? Heck no. Yea, you are different. Then, it all came crashing down around us. I'll never forget that horrible moment when you stood in the backyard and didn't recognize me. You didn't respond. You were standing, frozen and distant. Where was my baby? Without question, we took you to the vet. For many weeks thereafter, you were in and out of the hospital. It was terrible. Absolutely, terrible. When you came home, the medicine, the timings, your anxiety, our fear, your illness took over our household. I am so grateful that we had the major car accident weeks prior to you getting sick. Otherwise, how would I have paid it all? Despite all of this, you were still so happy. We figured out how to manage you. I was gone so much and I hate myself for that, but your grandmother was always there. We gave into your every whim and desire. You learned to work so that you could feel better. It was your way of rehabilitating. You helped your buela cook, clean, help with your siblings, throw the trash, and make a nice home for us. You had a purpose and that purpose was not to wallow in your illness, but to triumph and make everything count. I learned that lesson from you. And with the snap of someone's fingers, it was all over. I would give anything to retrace the steps leading up to that terrible day. To this day, my body still feels the agony of that phone call. My heart and soul completely shattered. The pain is incomprehensible and I have to live with it every day for the rest of my life. People say it will lessen with time, that I will find peace, and to focus on the future. I'm so tired of hearing that. None of that is true. It has been one year and none of that is true. Today I realized that I asked for this. Remember how I would plead to God that I would give anything to take this disease from you? Well, he answered my prayers. And, like you always do, you climbed out of the box...out of this realm...out of the pain. You climbed out on your own terms. I don't understand it. Maybe it was retribution for any sins I committed in my life. All I know is that this day broke me. I've re-built my life, but like anything that is repaired, it's never the same. It's always a battle. Every day. But like you, I can't let it be in vain. Like you rehabilitated yourself by working, that's what I have to do. I do it for you, to be like you. I know I can't give much, but I can try. I have to find the strength, the stamina, the "ganas" to fight for you and for the others. I don't know where my life is taking me, although I wish it would just end, but I have to get out of the box...I cannot contain my grief. I let it out. I give myself to my pain and it energizes me. It's amazing how one little, fluffy, ornery, proud, strong blue dog can completely change a girl. I'm a lot like you...you are a lot like me. Like mother, like son. There are a few consolations I can take from this: you're not suffering with that awful disease anymore, I will never stop fighting, and you're still here with me. It's hard to accept and have faith that you're right here and you've never truly left me. Our bond is entirely too strong for it to sever. I know that. I have to believe in that. I have to have faith that we will be together again. I have to be strong for you and our family. I'm sure everyone thinks I'm completely insane, but like you'd say "Y que?". I pray that I can make you proud. I pray that I can make a difference. And I'm thankful that I was chosen to be your mami. There are so many words I have to say, but those will come out with time. In the meantime, let's rock this life. Let's change this world together. Let's claw out of the box with all the fortitude we have and make it out together. This letter is In Memory of Porter who can be seen in our Aussie Album's memorial pages. I started this letter to you last month and was not able to finish it. So here I go again. It has now been 6 months since I put Porter down. I think I have finally turned the corner now and have come to grips with his death. I hope you are doing well. Our club is holding a raffle in memory of Porter and Ace at our October event to benefit Canine Epilepsy Research. We will be sending the money we collect to Toby's Foundation in hopes of helping stop this monster. It has been almost 5 months now since I put Porter down'. It has been harder than losing Ace. I think it is because I watched the monster eat away at Ace piece by piece for so many years and Porter was here one day and gone the next. It has been a hard 5 months I still cry for him. Nobody wants to talk to me about him because they don't want to upset me. The thing is I want and need to talk about my boy. Not bad things but the wonderful memories I have of him. How he was such a silly boy that could always bring a smile to my face if not a belly roll. The way he looked at me with that beautiful face. The way he smelled when I sunk my face into his fur. The way his coat felt when I ran my fingers through that beautiful blue fur. The way he made me feel like I was the only person in the world. How I just loved to watch that dog go by me' his movement was poetry in motion. How when he was young he would catch a chicken if it got out of the pen and bring it to me in his mouth and never even break a feather. He was such a gentle soul. Oh how I miss my boy. My great niece turned 2 in May and she loved Porter and he adored her. She has stopped asking where Poder is, she couldn't pronounce his name correctly. But it didn't matter when she called him he came running to her. When she was learning to walk she would start walking and then it would turn into a run as she started down the hill and she couldn't stop. But that was okay because her Poder would run down the hill and get in front of her and stop. She would come to a soft stop against Porter's side instead of a hard fall on the ground. She asked for him every time she saw me at first. We just kept telling her that Porter was with Jesus now. Then over time instead of asking for him she would tell me that Poder was with Jesus now. So I guess she has accepted the fact that Porter is gone. Oh Porter you left me way to soon my boy we had so many plans. Three years was not enough time to spend with such a good friend. Porter you will always live in my heart I will never forget you or stop loving you. So I guess it is goodbye for now my friend I will see you on the other side. This letter is from Kelly about her dogs Riona and Fearghas. I am the proud owner of two epileptic mastiffs. When Riona was diagnosed last February, yours was one of the first websites I found about canine epilepsy. Fearghas was diagnosed in September and this disease has completely changed our lives. I've made Facebook pages for both and will be doing all I can to raise awareness for this disease. We are in Massachusetts, so please let me know if you need any volunteers on the east coast to help raise awareness! Wanbli, an Aussie mix rescue who had a short life but was fostered and loved by Babette on the Navajo Nation. My husband and I foster puppies and kittens here on the Navajo Nation. Wanbli was one of those rescues. We are pleased to share with you this letter, about Loki, a police dog with epilepsy, from his partner. 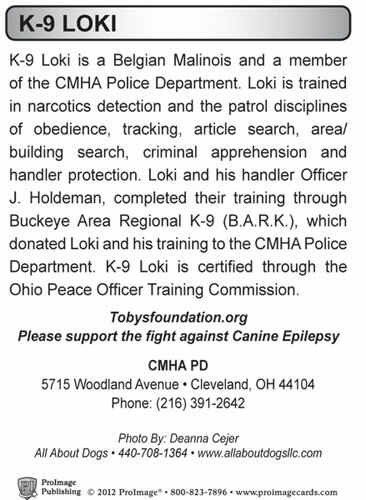 We are honored to be listed on Loki's trading card to help in the fight against canine epilepsy. Hi, my name is J Holdeman a K9 handler with the Cuyahoga Metropolitan Housing Authority PD in scenic Cuyahoga County Ohio (think Cleveland). My amazing K9 partner Loki, a Belgian Malinois, was diagnosed with epilepsy in Oct 2011 shortly after his first birthday. Needless to say I was terrified, both of the disease and of a premature end to our career together. Your website was one of the few non-medical based sights I found in the first few panic stricken weeks following his first few episodes. I was both heartened and saddened by your beloved Toby's story. Loki and I are fortunate that a Keppra regimen has suppressed his seizures without the lethargy associated with some of the other suppression meds. Loki has become fully certified by the state of Ohio and accompanies me daily during our tour of duty. 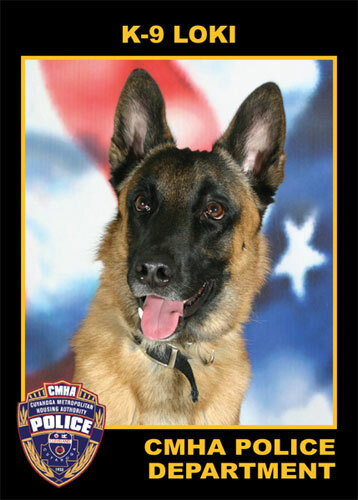 Our agency has recently approved the K9 unit to purchase 'trading cards' with the K9's picture and a brief bio of the K9 and handler on the reverse. I respectfully request permission to publish your web address at the bottom of our bio preceded by the phrase 'help support the fight against K9 epilepsy'. These letters are In Memory of Marley who can be seen in our Aussie Album's memorial pages. Thank you Pam for all you do! Hopefully there will be a few more donations for Toby's Foundation coming in. No dog should have to live with this terrible disease. Marley was the most special dog I have ever had in my lifetime. I have lost dogs before and it is always hard, but this one takes the cake. I believe he had a purpose in his short life and I am trying to focus on that now. I am sharing with you a video I did of him the day after he left us, I hope it shows how special he was. Thanks again for all you do. One day the fight will be won. Marley was just a few months over 4 years old when he had his first seizure. Despite increase in meds and adding new meds, they just got more and more frequent. He was an max doses of Pheno, Keppra, Kbr, and Zonisamide. Occasionally he would have to be hospitalized to receive IV valium to stop close clusters. In the past year he hardly ever went a week without a grand mal and started having more frequent partial seizures. The post ictal period started getting longer. He would run himself into corners, pace, seemed blind and confused for hours sometimes. It was exhausting for all of us (as I am sure you know). We struggled for the past year about putting him down, then he would have good days, he would play, eat normally, and such. He was the happiest dog we have ever had, so even though we knew he suffered at times, he also had such good times. That ate at us every day, should we, or shouldn't we???? It was a fine line. The last few days of his life were really rough, 10-15 GM's, he was just so tired, but he would not rest because I feel he knew he would have a seizure if he did. We finally made the decision the night before that we would take him the next morning. Somehow I think he knew, I laid down on the floor with him and he finally rested. We laid there together for several hours. I will never forget that last night. It was still very hard though as he ate his meal that next morning and his physical body still looked so normal. I know we did the right thing but I still second guess sometimes. I hope he understood and is feeling good now. You are right, he was an angel. God put him here for a reason, he is how I met my husband, so I will forever be grateful for that. Marley taught me more about love, patience, sadness, compassion, hope, and joy, than any other dog or human ever. God knew what he was doing. Marley, 1 other affected relative, and many unaffected relatives gave blood a few years back for research. They have contacted me a few months ago for updates on all of them. So Marley got to help in that way also. Everybody loved Marley, he was a blessing to many more outside of our home also. He will be missed by many for sure. I look forward to the day when we win this battle over epilepsy. My prayer is that no one or no dog will ever have to bare this terrible disease again. Someday we will meet all our fur babies again! Bret's dog Flynn has had good results with the extended release Levetiracetam tablets. Dr. Boothe's report that is referenced in his letter can be read in our September 4, 2012 AussiE-Update Newsletter and on our Research Updates page. My Australian shepherd, Flynn, has been suffering from a particularly nasty case of epilepsy since about a month before his third birthday. Four and a half years later he is still with us, despite scores and scores of horrific grand mal seizures and several hospitalizations. He has had good weeks and months, and once went 11 months without a grand mal seizure. He recently went nearly 11 weeks without a major seizure before suffering a fairly bad one last night. I wanted to do two things: 1. Thank you for your passion for curing this disease in the memory of your beloved Toby and 2. The regimen recommended in your second item below, the one mentioned in the study by Dr. Dawn Merton Boothe, is what I, quite coincidentally, have been following with Flynn with some success. The extended release Levetiracetam tablets have generally done wonders for Flynn, without terrible side effects. I have had to increase the dosages, though, as he has built up some resistance. I would recommend others follow such a regimen to ease the seizures and other symptoms. This letter is from Debi about her dog, Ripper. Ripper can be seen in our Aussie Album's memorial pages. This is a memorial letter for my baby boy, Ripper. He started to have seizures at the early age of 15 months. All testing and imaging came back as idiopathic epilepsy. After several very expensive stays at an animal emergency hospital, I worked closely with my wonderful vets to care for Ripper at home. We explored diets-- I made his own food and biscuits. We decided no vaccines and fleas and tick treatment as they triggered clusters. We never had a month without Ripper clustering 1-2 days. He was a wonderful companion and family dog. Unfortunately, the week before Labor Day, Ripper started to cluster daily. He was on Phenobarbital, potassium bromide, Valium both orally and rectally. After suffering approximately 30 seizures in a 48 hours we had the hard decision to make. We had Ripper euthanized on September 3, 2011. He would not be 2 until November 11. I miss him dearly and cry daily as I am while writing this. Epilepsy is a horrible disease and I wish for a cure. Donations will be made in Ripper's name. He has a photo in your photo album. As you can see he was and always will be my beautiful boy. This letter is from Margie about her dog, Stetson. Stetson can be seen in our Aussie Album. This moving letter is written from the perspective of Stetson, an Aussie living with epilepsy, by his owner Margie Sterioff who has lived and dealt with epilepsy in her Aussie's life for over 8 years. Stetson turned 11 years old on September 21, 2011. Margie serves on the Board of Directors for Toby's Foundation. Stetson has been featured in many of Toby's Foundation ads. I crawl into my owners lap and beg her to keep the horrible monster away, as I drop into a grand mal seizure. I can't always make it to her when it starts, but when it is over I need her more than anything. When I start seizing I always have what I hear her call 'cluster seizures'. All I know is that it starts and keeps going and going. I beat the battle with one monster and just when things seem to calm another more powerful monster attacks me. I have never been able to stop seizing by myself. My owner always has to do something to me to intervene. Often this results in a trip to the doctor and a change to what she calls my 'drug cocktail'. I take different medicines 5 times a day. My owner has had to change her life to take care of me. With all the worry, the medicines, the trips to the doctors and the ER, all the special routines - I know she didn't think I'd be around this long, but just when you think you have it going great though it all turns upside down in a heartbeat. A few years ago, I was nearing the end with little or no options left. We had gone through all the standard anti-seizure medicines and some of the newer ones, constantly adding or adjusting my medicine. I was rushed to the ER more times than I can count during those years to pull me out of the monsters jaws. I will never forget my owners' sad face as she lay on the hospital floor with me and all the tears that wouldn't stop. I wanted so much to comfort her but I couldn't. I was so scared; I didn't know what was happening. All I knew was that I needed her non-stop, day and night to help me. I would cling to her every breath. She would sleep on the couch with me because I couldn't stand to be alone. She was the only thing that I trusted to beat that monster. After these clusters, I barely knew where I was. I would forget how to go outside to the bathroom. She would have to show me what to do over and over. Retrain me. If she could keep the evil monster away for long enough, my brain would slowly begin to understand what I was supposed to do and that it was ok to go to sleep at night. I still need to have a doggie door to get outside every 2 hours though, probably an effect of all the medicine I take. I can't take the heat very well, so I need to be able to get into the house where it is cool, quiet and safe. I need to eat and have medicine at the same times each day to keep my blood levels even. Our life has never been normal due to all the special routines we have to follow, but keeping the seizures at bay would be as close as we could get, while always wondering how long or short this time would be. On top of all that, my best buddy turned on me. We grew up as pups together, romping and playing and loving each other. As soon as these seizures started, my puppyhood buddy tried to kill me. I am afraid that without our owner helping me, he would have succeeded. I defend myself, but I am weak and unsteady with all the medicine I take. Our owner has had to keep us separated. Whenever we move, she has to rebuild fencing in the yard and also in the house. We no longer can go on walks together, no longer can be in the same room together, no play, no longer do we all sit together on the couch and snuggle. Our owner divides her time so we both get enough attention. She has somehow found a way to make us both happy and loved. I've also heard her talk to my breeders as they would often call to check on me. I could tell that whatever was happening with me affected and caused pain to them as well. I was grateful they did everything they could to help and support her. This disease has altered in many ways my life, my owners' life and the lives of my breeders. Everyone that loves dogs and our breed is affected by this disease. This disease is different from others because just when my owner thinks about putting me to sleep, she knows that though today may be bad, tomorrow may be great with me feeling 100%. No one knows how long or short that time will be. It's emotional havoc for everyone. I can sometimes see how it all wears on her but we have such a great bond, she looks into my eyes and can tell that I am so happy. I smile all the time and that makes her smile too. I know how lucky I am to have the life I do so I tell her every day by gently nuzzling her hand in the only way I know how to say "I'm sorry...Thank you for loving me so much." We really need to find the genetic markers for epilepsy. Please support epilepsy research efforts! We are learning more every day and eventually hope to be able to identify this horrible disease - the first step in eradicating it. From Robin on the passing of her Sweet ACE. Robin first wrote us about Ace in 2005. Please see that letter too. - Ace can be seen in our Aussie Album's memorial pages. I sent a letter to Toby about my sweet Ace 10/6/2005 and sadly I have a follow-up letter now. My sweet Ace left us July 20, 2011 and went to Rainbow Bridge. It has taken this long for me to be able to write this email. I can't express the hole he has left in our hearts and lives. We loved him so very much and right now I can't imagine not having him. But they are only given to us for a short time and we have to cherish the time we have with them. I have loved Ace from the first time I saw him on the website at two days old and knew he was to be my dog. I wasn't even looking for a dog had no plans of getting one at that time but then I saw him and it was love at first sight. Long story short the older he got the more I loved him and knew that I had made the right choice in taking him. The day he arrived I cried because he was more than I had expected. I looked at his face through the crate when I picked him up at the airport. The moment I looked into his eyes I knew it was going to be a very special relationship. He has never disappointed me a day in his life. He has always given me more than I could ever ask for. I remember taking him to an AKC Rally trial the day after he had seized all night. I was torn if I should take him or leave him with Al. Al told me Ace would not be happy if I left him. So I took him with me and decided to go ahead and compete. He showed like a dream and placed 1st that day. How much more could you ask for out of a friend. I cried that day when I saw his placement. I couldn't believe that with the night we had that he had come out and showed like that. But then that was the kind of dog he was. I cried the night he left and have many days since and will for days to come I am sure. When it is feeding time and he isn't here, when I take the dogs out and he isn't here, when I sit in the yard with all my boys sitting around my chair he isn't there. I know life goes on but I really miss my friend. I am still a little slow answering emails about Ace, but it is getting better each day. He was my heart dog so I cry when I talk about him, or write about him. I am actually considering writing a book about Ace's life. He impacted so many people because he still went to shows/trials with me and people watched how his life and body were eaten by the dreaded disease. We were blessed as we actually had one full year in the middle of it all where he stopped seizing for no reason. He had seized for two weeks straight with multiple grand mals every day and the one day just stopped. Then one day it all started back as quickly as it stopped. We have no idea what stopped the seizures and kept them at bay for a year, or what made them start back after a year. But we really enjoyed that year. He had a rough life he was 2 1/2 when he start seizing and would have been 9 the 29 of August had he not died in July. Yes please add my letter to the website with the photo I sent you or Ace or the one I have attached. I love both of these photos of him as both of them have such fond memories. The one in the tub he had been working sheep, the one thing he could always do even after the seizures, and was cooling off. And the one attached of him playing in the snow. He had such a great time that day I think he has a smile on his face in the photo. And I think it shows the deepness of his soul in his eyes. He ran in the snow until his coat was wet. I remember how I loved to hold him tight and sink by fingers into his coat and bury my face in his fur. There was nothing like that after a long day at work it was like my troubles and stress just faded away in his fur. Or just sitting on a hill overlooking an agility trial, that he was able to compete, where I just sit with him lying beside me with his head in my lap. I remember that day there were several people who didn't know us came over to tell me what a beautiful boy he was. These are the memories I am trying to hold on to now. Remembering competing with Ace at a Rally trial and all of the sudden he realized that his pet sitter was in the obedience ring next to us competing with her dog. He began to bark wanting her to look at him. She never stopped competing and Qed but really messed up her dog because of all of his barking. He just couldn't understand why she wouldn't come over to him and pet him. She and I both laughed after we got out of the ring, I am glad that she could laugh about it. But that is just the way Ace was. He loved the people in his life. I am sorry I can go on all day about my sweet boy. He was a very big part of my life. He and I tried to educate people about the disease every time we had a chance. I can only imagine how much you miss Toby. Please add either the photo of Ace in the tub or the one attached of him in the snow beside his letter. Please add under his photos. Good bye for now my sweet sweet friend I will hold you in my heart until we meet again. Sleep well and know that you will always be love. I will be holding a raffle in honor of Ace at our club trials/shows the end of this month to try to raise money or research and to educate people. I can't rest until we at least have a test to know if the dog is a carrier or not. Thank you for all the work you have done and know that we are all thankful! This story was sent to us from Margaret and John Wilkinson in Scotland. It is in Loving Memory of their dog Megan. Megan's story "Never Forgotten" by Margaret Wilkinson was published in The GSD National Magazine Official Journal of the German Shepherd Dog Breed Council of Great Britain Volume 25 No. 8 August 2011, printed in England and is distributed Worldwide. It is reprinted here by permission. John and Margaret Wilkinson have been working to raise awareness of canine epilepsy in the UK and the importance of getting pedigree checked by the Breed Health Co-Ordinator. This letter is from Cali's "Mom" - Cali can be seen in our Aussie Album's memorial pages. We got Cali from the Mariposa SPCA in California on May 1, 2004. They thought she was 9 months to a year old. She'd been picked up by the dog catcher and no one came to claim her. Her seizures didn't start until she was about two years old. I thought she was dying when she had her first one, and a part of me died with each successive seizure. Her seizures were always major grand mals, and were never regular, sometimes monthly, sometimes more often, we had a year seizure-free from July 2009-2010--not sure exactly why. But then her liver began to fail from the PB and she started having worse seizures, more often. Even after we got her liver to rebound, the seizures kept getting more severe & frequent until the final endless cluster on Saturday March 5th. She was euthanized early on the 6th. Her motto seemed to be "What are we gonna do now that's fun??" We miss her so much, and we are soon to adopt a new Aussie puppy ( Cali said it was a good idea). 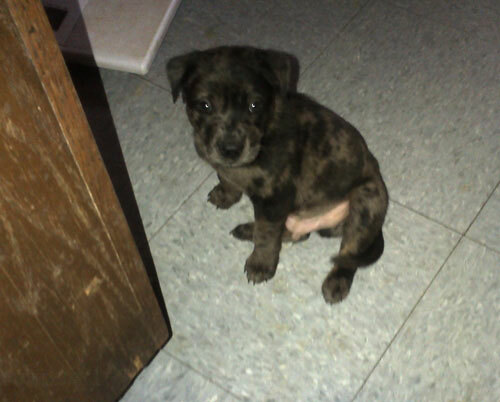 We will pick him up on May 7th. This is a letter from Karla about her Yorkshire Terrier, Princess Baby. Thank you for your kind words and great suggestions... Toby's life was important and he is now saving others through your love and devotion!! On Sat. my Vet. told us .. "I am sorry there's nothing	more we can do" ...I was Heart Broken... but after your e-mail I feel like at least I can learn from the web-site you have provided and maybe there's a shot to keep her in our lives a little longer. My husband loves her just as much as I do... but was unwilling to give meds until I told him about the 3,000. bill... He is now participating fully by helping me get her the meds at the same EXACT time every day... so far so good... but I am never optimistic...always holding my breath for the next seizure... she also has other seizure activity...when she is not in full seizure I catch her having like a Turrets syndrome movement of her head...over and over....those are smaller ones... then I also see agitated behavior sometimes as much as 6-8 hrs before a big seizure... that is the time we give her an extra dose of Phenobarb and hope for the best... we keep trying different things with the meds and see where it takes us! She has not been on the Potassium Bromide as of yet... he was trying the Keppra first and we use a generic brand so it's not nearly as expensive... we are	spending on average $100 per mo on her medication to make sure she gets the proper care! Princess Baby started her seizures at age 5. Thank you for your guidance and I appreciate your insight... I am a fighter and so is she... I am not even close to being ready to let her go...but the signs are all there... it's only a matter of time...which I will do my part to make it longer rather than shorter! Again...Thank you for your help! Below is Tinka's Story from Carina Josefine in Norway. It was September 2002 and my mum had just gotten the message that a puppy we sold in January the same year had to be removed from her home due to allergy. I was 19 and lived on the second floor of my mums house at the time. My mum, who has bread dogs for 40 years, had already made arrangements for a family to come look at the 9 months old dog as soon as the dog came to our house. I came home from school, and stopped by my mum's living room to look at the dog she had just brought home. It was a fragile dog, scared of new people and new places. She was sitting at my mothers feet when I came in and sat down in a chair across the room. I looked at the dog, she looked at me. I got goosebumps all over, and nothing else existed as our eyes met. The dog walked over, and sat down by my feet. And that is where she has been ever since. My mother is a very "down to earth" kind of woman, but to this day she says she will never forget what happened that day, how something unexplainable happened between me and that dog. The dog was staying, there was no two ways about it. My mum called up the family that was meant to come look at her, and told them we just had to keep her ourselves. The dog's name was Tinka, and Tinka had made her choice. We had to take precautions around Tinka, like shutting her in a different room when we had visitors over, and making sure other dogs didn't get too close. She just got too scared. Her confidence was low and we started training agility to get it up. She was such a natural talent on the agility course. She was doing quite well, except these odd episodes of being all wobbly and throwing up. For a period we had it down to the food we were feeding her. Later we thought it was lack of magnesium in her body. Tinka's mum, Cassie, had some of the same symptoms and had gotten better once she got extra magnesium. (We later understood her mum probably also had epilepsy. We took that line of dogs out of breading completely.) Tinka however did not improve from the magnesium. The episodes got worse over time, and we decided to take her to the vets. He sent us to a skilled neurologist, which confirmed that Tinka had epilepsy. My first reaction was fear. I was scared this meant the end of my precious dog. The neurologist could not make any promises, and we were sent home with a prescription on phenobarbital. For nine months Tinka did not have a single seizure. She got a lot better around new people and animals. Our theory is that as long as her epilepsy went untreated, she associated new people, animals and places with the seizures she got from the stress these things caused her. Unfortunately the seizures started again. It wasn't just a bit of wobbeling and throwing up anymore, she had real seizures. She would lose control of her body, unable to walk or keep her head up. Her body would go all stiff and her feet would peddle. I have no idea how many times I ran down the stairs to my mum with the seizing dog in my arms: "She is dying!". Some times she would have clusters, driving us to the vet in the middle of the night. It was after one of these nights we also put her on potassium bromide. It became very clear that her clusters would increase when she was close to getting in heat. Once it properly started it would calm down. We were very scared to let her have the surgery because of the narcosis, that we had heard could be risky for an epileptic dog. However the connection between her hormones and the seizures were so evident we finally decided to go through with it. When the vet phoned us and let us know Tinka came through the operation ok, we started crying and my mum drove on a red light. The periods where we would have cluster after cluster, day after day, ended after this. She would still have seizures, and sometimes still clusters. I would sit there with the rectal valium in one hand, and with the phone in the other, crying to my vet, who tried to be my vet, my friend and my therapist all at once. He did a great job and got me through alot of panicky nights. Tinka became incredibly spoiled. She could never be alone. She wasn't one of the "dogs", and she clearly let us know that if we, God forbid, tried to treat her like a dog. At night she slept on my pillow so I felt certain I would wake up if she had a seizure. While all this was going on, we still managed to live our lives the way we wanted. Me and Tinka both are way too stubborn to let epilepsy get in the way of anything. We did agility competitions, and did really well too. We even went to Spain together. The second time I went to Spain however, Tinka had a 6 month long seizure free streak, and ( let my best friend watch her. But not without giving her a 20 pages long "job-instruction" with do's and dont's, what to watch out for, and important telephone numbers. Of course my friend had to take an oral exam in this before i could trust with my special dog. The "breakthrough" for me was when I discovered the Epil-K9 mailing list. All the thoughts and the worries I thought i was alone with, turning my life upside down for a dog... All of a sudden I found people around the world with the exact same thoughts and worries, also turning their lives upside down for their epileptic dog. I read everything about canine epilepsy I could find. I was sat for hours just searching the internet for resources, facts and other peoples experiences. When Tinka feels a seizure coming on she will come to me. I either lay down with her, or lift her up into the sofa or the bed to me. I put my face close to hers, stroke her, and talk gently to her, telling her how brave she is. She knows I'm watching out for her, and she can focus on her task: Fighting of the monster that rides her. When I feel her body relaxing and I know she can keep her head straight again, I look her in the eyes. She has always been big on eye contact, that dog. As our eyes meet I know she has come back to my world, victorious once again. Once she can walk, we will find her some water and take a stroll outside. By this time Tinka will usually be quite alright, and maybe even try to play a little. she gets over it a lot quicker then I do. I will still worry for hours. A few years ago I made the decision to take her off the potassium bromide, as I'm convinced it cause problems with her digestion. I felt confident we could both handle a bit more seizures, if it helped her stomach problems. I later discovered Tinka has a food intolerance, but I'm still not convinced the potassium bromide is in the clear, therefore she is still just on Pheno. Tinka turned 9 in January 2011 and she still get one or two seizures a month. 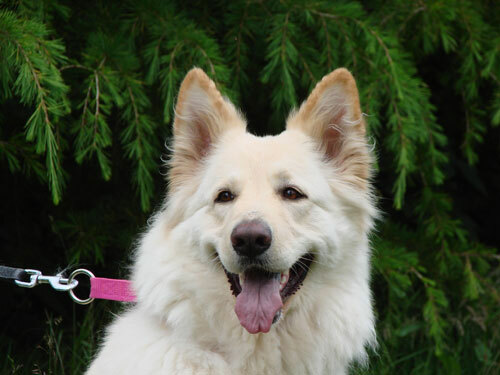 Apart from the seizures, she is a playful and positive dog with a lot of energy and joy for life. She has an incredible personality, and the bond I have with her, I will never have with another dog. I am so lucky to have her in my life. Diesel can be seen in our Aussie Album's memorial pages.. This letter is from his foster parent, Marla of K-9 PlayTime, Inc. I am mailing a donation in memory of my BELOVED friend Diesel Blaige who had to be euthanized last week at the RIPE ole age of THREE due to his increasing CLUSTERS of Grand Mal Seizures that didn't seem to respond to any amount of meds. He was my MOST favorite, inspirational foster EVER, adopted by my BEST friends...I was SOOOO excited to be able to share the rest of his life and then BAM! IF you are able/willing PLEASE send a note to his parents. Also, I would LOVE it if you wanted to add his story and photo to your website. Thank YOU for fighting this AWFUL disease!!! Indy can be seen in our Aussie Album's memorial pages. My wife and I have been married for 25 years and we never had kids. She was always reluctant to get a dog, so when she finally said yes it took me a month to decide on which breed. The aussie stood out the most to me and I'll never get another breed now. His seizures started last year July and after doing the whole MRI and spinal tap thing to rule out a tumor we knew that he had epilepsy. Indy went with me everywhere I went. We took him to all of our family outings, whether at my sisters or camping. He was the only dog in the family that went to Easter and Christmas get togethers. If he wasn't with us, people always asked where he was. He was having clusters of 4-6 seizures every 2 weeks until May when he started to have 8-10 every month. The weekend of August 13-16 he had a total of 20 seizures. We decided that that was enough for him. The vets couldn't control them and he was a shell of himself. It broke my heart to see a dog that could chase down any Frisbee or soccer ball with ease turn into a dog who stumbled when he took off running most of the time. We still cry when we talk about him. But the good news is that we're are getting another puppy on Oct. 1st. I'll send you a picture. Thanks again for your comments on our Indy. I've included a picture of our new puppy. You can use either picture. 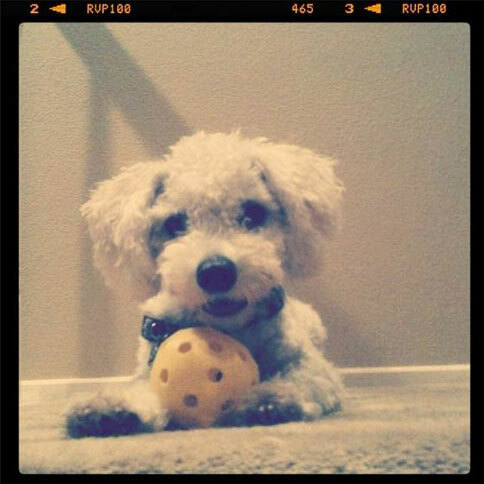 The one was taken at Lake Tahoe when he was still a puppy. He truly was a beautiful dog. People stopped us all of the time to ask about him. This letter is from Nancy about her dog, Mardi. Mardi can be seen in our Aussie Album. I saw on the Aussie Agility Yahoo Site that you are looking for new ideas for ads. Our dog Mardi was honored by her breeder, who by the way took every care breeding the litter, and her friends in the current Aussie Times, the Agility issue, for finishing her ATCH. We would be proud to help, as we have never kept Mardi's epilepsy a secret in the hope that those who do keep it a dark secret will see that a dog can have a happy life filled with love. We have given blood in the hopes of stopping this horrible disorder. Let us know how we can help. Skye can be found in our Aussie Album's memorial pages. 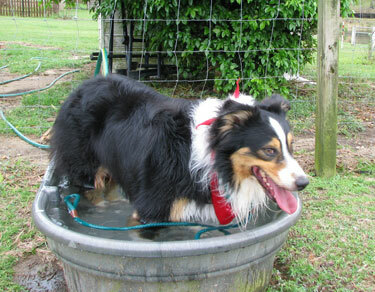 Please receive this donation in memory of our rescued two-year old "Aussie," Skye. The work you and the University of Missouri are doing is so important! We'll never know if Skye's horrific rages were the result of nature (epileptic or canine rage syndrome) or nurture (abuse before we got her), but we want her too-short life to count for something. This letter describes an epileptic Aussie living in Finland. Santtu can be found in our Aussie Album's memorial pages. Of course, I'm not angry to anybody, this just happened to us and the breeder had done her best. She is very sorry and agrees my publishing what happened. There were only under 200 Aussies in Finland when I got mine .I published our story here to Aussie-people and tried to wake them up to pay attention to this problem in breeding. I also published CA's texts on her permission. This letter describes another dog affected by epilepsy. This touching letter is written by Zephyr, the affected dog's sibling. 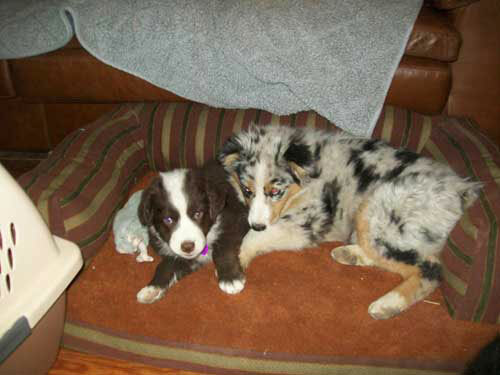 When my parents brought me home, I was delighted to find I had a black tri mini Aussie sister. We had a lot of fun chasing and playing and running through the house. I can just see her with a toy in her mouth dribbling two tennis balls. When I was five months old and she was seven, my mom saw her have three partial seizures. My mom is an occupational therapist and was confident our family could handle this. When my sister was eight months old and one week before she earned her Canine Good Citizen award, she had her first grand mal seizure. Months went by and between her seizures we had a lot of fun. After diagnosis my sister graduated from beginning, intermediate and advanced agility. Through the Delta Society, she was certified as a therapy dog. We enjoyed hikes in the mountains and walks to the baseball diamond. All of this paralleled countless blood tests, Phenobarbital increases, the eventual additions of Bromide, Felbatol and Neurontin to her daily medication regimen and relentless seizures. My sister went to a neurologist at Colorado State University but she was never stable. In the final months of her life, my parents saw three seizures a week, then three a week end, then three a day. I saw more because I was home. Finally she developed either psychomotor seizures or dangerous post ictal behavior. She followed her second to last seizure with 11 hours of running, pacing and whining. She looked like a deer in the headlights. The rectal Valium my mom used in emergencies had absolutely no effect. After 16 months of aggressive treatment, my parents knew they could not make this stop, they could not make her better and they could not keep her safe. Hearts broken, they delivered her to the Rainbow Bridge on October 4, 2005. She was almost 25 months old. My sister was the dearest, sweetest, most affectionate dog ever even if she was bossy. My mom says she was wicked smart and that she had a black belt in manipulation. When I hear that I know she is forever loved. Since her death, I have done my best to step up to the plate to take care of things. My sister's DNA and that of her family are at UMO and I understand they are very close to a breakthrough. Please look for our donation and use it to fund research there. I 'see' a future free of epilepsy for the Australian Shepherd. This letter describes another young dog, Ace, with epilepsy and how this cruel disease has affected his family. Ace can be found in our Aussie Album's memorial pages. My sweet Ace was born August 29, 2002 one of a litter of six males. He stood out from the moment I saw him. I first saw a picture of him at 3 days old over the internet and I fell in love with him at that moment. We were not even planning to add another dog to our household at the time. I held off telling myself that we didn't need another dog for a couple of weeks. Then I saw a photo of him at 3 weeks and that was it, he was to be mine. I showed my husband his photo and he told me to contact his breeder and tell her we wanted him. We made the arrangements to fly him in when he was 10 weeks old, and the moment I saw him in the airport I was just blown away by him. He was everything I had wanted in a dog. I called my husband on the way home with him very excited telling him Ace was as beautiful as we had thought. I called his breeder and told her in tears that I could not believe that I owned a dog of this caliber. It was truly love at first site with him. He matured and never disappointed me. Everything I tried to teach him he learned and did it with a passion. In obedience class when I was teaching him the front command at 5 months old it was amazing to watch him learn. You could see his eyes light up when he figured out what I wanted him to do. You could actually watch him learn. Then at 9 months old he took his first Reserve win in conformation. He went on, with very limited showing, to earn a couple of other Reserve wins and two three point majors. We were on our way for sure. Then we started competing in the agility trials he was just awesome and such a joy to trial. We went to an agility trial April 2nd, 2005 and he finished 4 agility titles that day, 2 NADAC and 2 ASCA. He took first place in 3 runs that day. We had an awesome day. Then everything came crashing down April 4th 2005 at 7:00AM. My husband came screaming through the house that Ace was dying. My heart sank, I was not dressed and the dogs were outside going potty. I could not find my housecoat fast enough, it was only seconds but it seemed like hours. By the time I got to him my husband was already at his side. He thought that Ace was having a stroke. I looked at him and told him no it was a seizure. The seizure ended and my husband and I both cried. We took him to the vet who told me that it was most likely EPI, but we would wait and see if he had another seizure. Sure enough April 10th, 2005 at 11:00PM another seizure, so he started on medication the next day. We have been dealing with this ever since then. Currently he has seizures about every 3 to 5 weeks. We have gone through the guilt of what did we do wrong. Was it something we feed him or didn't feed him that caused this? But we have come to the realization that we, nor anyone else, did anything wrong it was simply in his genes. His breeder was devastated as well, but she has been VERY supportive. She was responsible and called everyone who owned a sibling or half sibling to let them know about Ace. We have a very strong support group and I am thankful for that. But we are blessed as for us there is life after seizures. This summer Ace competed in Rally Obedience for the first time and took First place his first time competing. I cried when they handed me the first place ribbon. Each run is much more precious these days as I don't take any of them for granted. Then the next day he went in and earned his second leg toward his Rally title. He will also be competing in the Pre-Nationals agility trial, so just because your dog has seizures don't mean the end of the world. We simply had to learn to be thankful for whatever he could give us. If it is just to be our companion or maybe to compete at some level. Bottom line is I will never regret picking this boy to join our family. He has been everything I have ever dreamed of in a dog. We will love him for as long as we have him and try to do what is best for him and what he enjoys. We probably won't finish his Championship because he doesn't enjoy conformation. 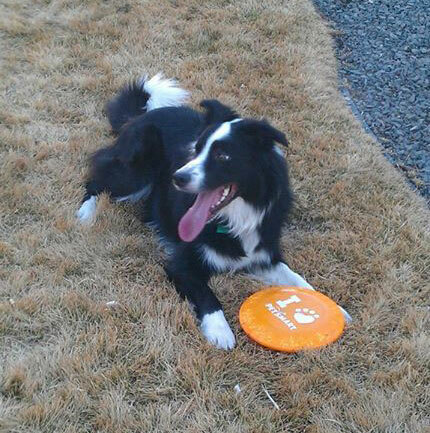 As for agility and herding we will move forward with that at a pace that will depend of Ace. He loves both of them and I think it would hurt him more if he was not allowed to continue with these. We will continue with Rally Obedience but I don't know about traditional Obedience at this point, once again it will depend on Ace. So we are still thankful for our sweet Ace. He is still just as sweet and loving as he ever was, and is a very silly Aussie with a sense of humor. He loves to make us laugh and we enjoy laughing at his silly antics. Ace is a joy to live with and we will continue to treasure each day with him. Murphy lived to almost 9 years old. The two letters from his "Mum" about how he came into their lives and about his passing are used with permission. Murphy can be found in our Aussie Album's memorial pages. My sweet boy, Murphy, died yesterday. Murphy lived with epilepsy for seven years (he would have been nine this January). A tremendous level of drugs were required to allow him even modest control. It was always a balancing act between number of seizures and level of ataxia. His seizures lately had increased in both type and frequency. We knew we were going in a bad direction. Murphy's liver was finally showing effects of all these years of Pb and then Felbatol, but that was the least of his trouble. During a series of seizures last Friday, he bit his tongue and aspirated a large amount of blood and saliva. He developed aspiration pneumonia, but that, too, was the least of his problems. Upon examination, his vet discovered he had a very irregular heart rhythm, sort of like a jackhammer. His heart rate was alarmingly high, yet he was barely circulation blood and had a very weak femoral pulse. Something, along the way, had damaged his heart. Murphy was in heart failure. We were told another seizure could be terrible for Murphy and us. We'd been so lucky to be able to control his seizures at home, never needing to rush to the ER. We made the decision to not let this be how Murphy spent his last hours on this earth. We wanted to make Murphy as comfortable as we could and spend a few more days loving our boy. Antibiotics helped his pneumonia and he did perk up just a bit. When our vet saw him on Wednesday he had 4 pounds of fluid in his belly and was showing signs of discomfort. For the first time in his life he didn't want to eat. I took him home and spoiled him rotten for the next 24 hours. All he wanted to eat was poached chicken and pizza crust, so that's what he got. He watched my every move and wagged his little stump every time I told him what a good boy he was. He even pushed his tennis ball into my lap one last time. On Thursday morning our vet, our dear friend, came to our home and helped us say good-bye to the sweetest Aussie we've ever known. He died with his head resting on my arm, my husband and I both petting him and me telling him how much I loved him. We told him all the wonderful Aussies that had gone before (Joey, Elsa, Bert, Cassie, and J.D.) were waiting for him. Murphy was the kindest boy. He never met a man, woman, child, dog, cat, or bunny he didn't love. Somewhere, there are six beautiful Aussies running strong and free. They all smile with shear joy of flying over the ground with strong legs and healthy bodies. And the biggest grin of all is Murphy's. This is what I feel in my heart and what I see in my mind's eye. And that is how I'll remember him all the days of my life. It was suggested to me recently that perhaps, in some way, we are chosen by our special pups. This got me thinking about my epi angel, Murphy. 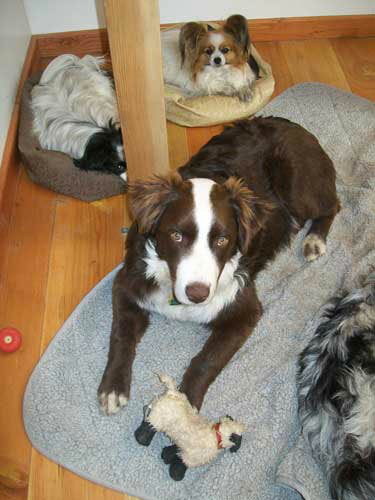 Years ago, very dear friends had a beautiful litter of Aussie pups. They invited me to come to lunch, so I could see them at that wonderful, roly-poly stage at 6 weeks of age. I had no intention of getting a puppy. I already had 3 Aussies. Besides, I was sure they were all spoken for. When I arrived, all the little tykes greeted me, but one in particular took a huge liking to me. 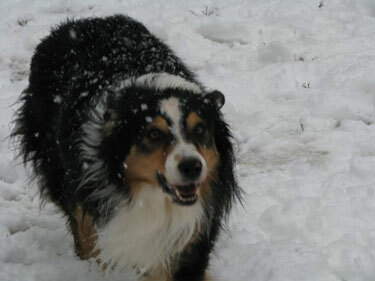 He was a fluffy, adorable red merle. Even after the other pups wandered off, he followed me everywhere. All through lunch he watched my every move, and gave me the "full body wiggle" every time I spoke to him. I couldn't stop thinking of him all the way home and called my friends the next day. After jokingly accusing them of conspiring to make this happen, we all agreed the red merle boy must be my puppy. Twenty-one months later, Murphy had his first seizure. My friends were devastated. They couldn't stop apologizing. Murphy was the only pup in the litter to have seizures. All of them were spayed and neutered. As the years went by, we often talked about Murphy's life with me. (He was almost 9 years old when he died of heart failure). They always said how lucky he was that I was him Mum. We agreed with all our hearts that he picked me. Yet I always felt that I was the lucky one. If I could go back to that sunny yard full of puppies, even knowing what lay ahead, I'd pick that wonderful boy again. These letters are stories of longevity and survival in the face of epilepsy. Blue is 10 years old and is shown in the Aussie Album. Blue's Mom and Dad are writing this short letter to maybe help encourage other Australian Shepherd owners who suffer with their dogs through seizures. Blue, a Blue Merle, was born September 1, 1995. We brought him home at ten weeks and everything was wonderful. We never had to house break him. He was full of energy plus. He went through the four classes of obedience and was outstanding. He was the smartest dog we had ever had. He loves everyone and always tries to please. He is great with other dogs and children. When I say dinner is ready, he runs to get Dad. Then one Saturday night we were getting ready for bed when suddenly Blue started thrashing uncontrollably. He was almost two years old at the time. The vet was closed and we were panic stricken. He finally managed to calm down only to have another attack. We managed to find an emergency hospital and were on our way. In the car he had one more seizure. At the hospital they said he had epilepsy and kept him until Monday when we could take him to our own vet. He evidently had several seizures while under their care. Monday we took him to our vet Dr. John Agostini in San Clemente. They made many tests and tried different dosages of medicine. Finally he was able to come home. Every so often he would have more seizures; we had pills to give him and then the vet would adjust his medicine. This went on quite often until Dr. Agostini was finally able to get the dosage that worked. Blue has blood workups often to make sure all is well in his system. He has been on Phenobarbital 64.8 mg., two pills in the morning and two pills at night. Also, Sodium Bromide 250 mg. once a day which adjusts as needed. Blue loves walking and riding in the SUV. He sits like a perfect gentleman. You would think he is harnessed in but he is not. He is the love of our life and on September 1, 2005 he will be 10 years old. We have been blessed to have him this long and we only pray he stays a little longer. He is our beautiful boy. Good luck with your wonderful companion and always make a routine that gives the medication at its due time everyday. Samee is 9 years old and his picture can be found in the Aussie Album. Dearest Pam - It's Lynee and Samee again - I just got off the Toby Foundation web site with tears in my eyes. You are truly special to tackle this disease as you have. I would love to briefly tell you my Samee's story - He will be nine on August 2nd, and I am truly grateful for the time I have had with this wonderful pal. It has not been easy on my husband and myself, but I can't believe nine years has gone by. We got Samee from a supposedly "reputable" breeder - to this day, I have not spoken to her since - I believe she had to know this was in the lines, as Samee was from a litter of five, his sister had it also, she was put down. Anyway, we brought this beautiful tri-black Samee home to my household of a German Shep and Wheaton Terrier at the time. They all got along wonderfully, although my Wheaton was very old and Samee was sort of the replacement dog, Brandee died a week or so after Samee arrived, I truly believe Brandee was satisfied with his replacement!!! LOL. Samee was 18 months when he had his first seizure, like you I didn't know what I was looking at as he began to run in circles, the circles got smaller and smaller until he fell over paddling with foam coming out of his mouth. I truly thought he was dying before my eyes. Then just as it had started, he popped out of it and again was my wonderful Samee. He was put on pb medication two months later when he had his second grand mal. My vet did not know anything about epilepsy or kbr etc. We all just sort of felt our way through this disease. Samee had one status episode over a weekend - I thought he was going to go or I was going to have to make a decision. After a weekend in the ER being pumped with valium and pb (they ran out of both, can you imagine!!!) He again popped out of it and after one week home and being very disoriented due to all the meds, I decided it was the last time I would go to the ER - I could do the same thing they did at home and it would be much less stressful for Samee. I had already found the wonderful Epil-k9 list and I do believe I could not have gotten through nine years without them. I have used so many of their tips, i.e., breyers ice cream etc. I have tried a lot of things over the years, i.e., rescue remedy, melatonin - all seemed to help at the time. Samee seizes about once a month - I seem to have it under control for him, I takes a lot of meds, he seems to tolerate them well. I don't let him get too stressed out - when he does seize, we have our protocol - mega doses of meds, ice cream, a butorphanol (muscle relaxing drug) to help him sleep it off. This all seems to get him through without clustering. I believe Samee has already won the battle - to have survived this for nine years - he is a happy, wonderful dog. My husband and I have decided as long as his quality of life is good, we will continue what we are doing. Samee shares his life with one more GSD, Karlee who is seven. We live in Connecticut now, but will be relocating to Sarasota Florida in a few months, something we have been working toward for over four years. I would have more dogs, but I want to get to Florida with just the two for now and let Samee live out his life without too much stress. I could go on and on with stories and episodes, but you get the picture. You are doing a wonderful services for us Aussie owners. I love reading all the stories. Keep in touch. Will get Samee's picture to you asap. Stay well, hugs and waggles to Toby. Samee is nine on August 2nd/seizures started at 18 months. This letter dates the problem of epilepsy in Aussies back to 1984; this is the earliest case we have received thus far. The writer is a single parent and she credits her local vet for being instrumental in helping her handle the situation. 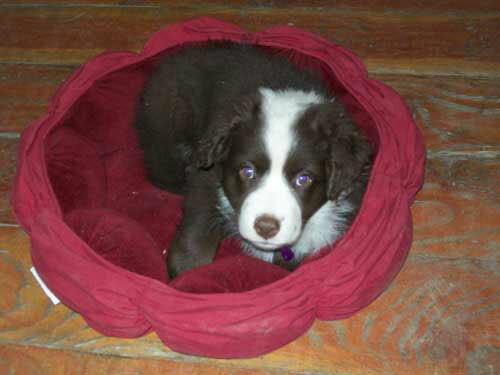 The dog's name is Mandy and she can be found in our Aussie Album's memorial pages. I just happened upon a copy of the Sept/Oct Australian Shepherd Journal and the 1st thing that caught my attention was the "In Memoriam" for Shadow. What a cutie. Next I saw the Feature Article on The Face of Epilepsy. What a wonderful article. I too understand the suffering of living with and loving an aussie with epilepsy. In 1984, after researching many dog breeds, I put a down payment on a puppy from a litter born just before Thanksgiving. I wanted a female and a blue merle (preferably w/ blue eyes). This litter of 7 had 2 blue merle females. I was drawn to one but the breeder said she would have brown eyes and encouraged me to consider the other one if eye color was important. A friend was with me who also suggested the 2nd female. I agreed and left my down payment. On Christmas eve I drove back to the breeders to pick up my puppy to have here for my daughter for Christmas. Everything was set for me to take my new puppy home except when I got there it was the other puppy who kept following me. She had been my 1st choice until the others changed my mind. This time I wouldn't be swayed. I told the breeder I changed my mind and wanted the brown eyed one. I believe it was fate. At 11 mo she had her 1st seizure. It wasn't real bad and I wasn't sure what had happened so I did nothing. 3 mo later another small seizure. then at 1 1/2 yr of age she had her 1st grand mal seizure. It was Memorial Day and about dinner time. It had been a hot day so when I called the emergency vet office they told me it was probably just heat related and put some cold compresses on her face. She couldn't get up and just laid there. I freaked and called my regular vet at home. He told me to meet him at his office. He was the one who told me that it looked like she had had a grand mal seizure. We discussed the other small seizures and he said she might have epilepsy. He kept her there for several days and when I picked her up he confirmed it. I don't remember what tests he did or anything other than he said her condition could be treated with medication. It took awhile to get her on the right meds and regulated. Even then once or twice a year she'd have a grand mal and would need to be hospitalized. I can't speak highly enough about my vet and his help and support through the entire life of my dog. I could call him anytime day or night (usually it was in the middle of the night) and he'd get us through it. I lived daily with the fear I might forget to give her her meds and that it would trigger a seizure. She was the best dog I ever had. So many people would ask me why I didn't just put her to sleep. They knew the cost of medication, the toll of guilt that I may have done something to trigger it, the worry of how long she could live like this. I told them it was fate that had me choose her. If she had gone to someone else they may not had dealt with her condition. The breeder was of no help. I think they resented me calling them when I found out she was an epileptic. I didn't want to return her or get my money back. I just wanted to know if any of the others had the same condition and to notify them for future breedings. They said none of their dogs ever had epilepsy. All in all she lived 12 years. If she was alive today I would certainly donate her blood to help the cause. I would very much like to send a picture of her for your photo album. I will try and see if I can scan it and email it. If not is there an address I can mail it to? Today I have another aussie and a aussie cross. Both are healthy.